We are into promotional leather products such as wallets, jackets, handbags, executive bags, folders, leather accessories, etc. 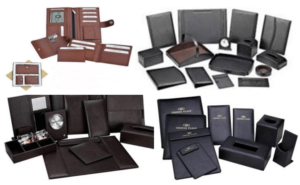 We provide the complete gifting solution with our wide range of pure leather and leatherette (leather look like) products for different types of organizations, business, corporate houses, institutes and at various promotional events. We provide you with great gifting ideas, each from the unique to the classic, and our aim is to inspire you with an array of cool presents from SPARKET CORPORATE GIFTS for pleasant surprises. We use our expertise to help our client identify the perfect product which can match the occasion and connect as perfect brand recall to increase your product sales. We help you excel the subtle art of gift giving for all occasions. Our gifting solutions for events are conceived to offer options that’s classy, reliable and of high quality. When it comes to corporate gifting nobody understands your needs better than us. All the products can be embossed with your logo to ensure that the user remembers you fondly. This folder is mainly used for the conference with all utility pouches including a notepad and another type containing the magical handles to carry it around comfortably. The Product is available in pure leather and leatherette (leather look like). Colors can be choice of black / brown/ tan, dual colors etc. Passport holders, cheque book holders in various shape and size to carry various travel documents handy. Ideal as promotion gifts for tour and travel agencies. Leather Wallets, belts, key rings, visiting card holders which can also be arranged in a box as gift set. Women’s gifts are Clutches, sling bags, work bags, party bags, gift sets etc. 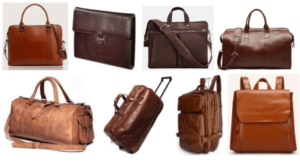 Leather Bags: – Laptop bags, office bags, messenger bags, duffel bags, travel bags, backpacks, trekking bag etc. 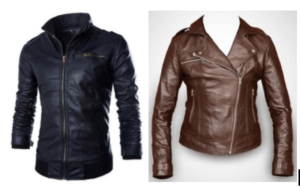 Jackets for both men and women full or half sleeves as required. This is the folder mainly used for the organizing the jeweler with all utility pouches with beautiful velvet finish inside available in tri fold and bi fold in varied choice of colors. This the multipurpose electronic accessory organizer where all the electronic gadgets can be easily organized. Also available for stationeries in folding type. This product is designed for the iPad holder which also carries the note pad and pen holder depending on the actual requirements of the recipients. This is tray which is made of leather which is mainly used for the table and car accessories. This is the personalized gifting product which can be used for keeping and carrying multiple watches. The spectacle case will safeguard the sunglass from getting scratches and give extra appeal to your fancy products. 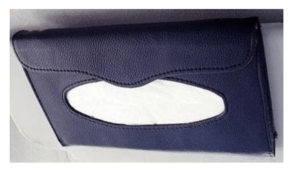 This is the pure leather or leatherette tissue holder which is used in the cars for neatly carrying tissue papers conveniently attached to the sun visor. Please feel free to write to us for all customized requirements in pure leather or leatherette corporate gifts with your name embossed inside for the silent messaging about your branding to your target audience.